As a building material, vinyl siding as compared to other things is new as it was introduced in the late 1950’s as a substitute for aluminum siding. In the beginning siding’s reputation was viewed as negative because it cracked, faded, buckled, and sagged. 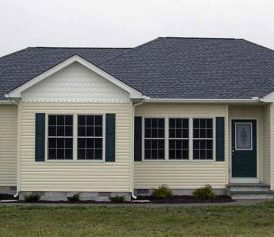 Due to all of the changes in the product’s chemistry and installation techniques siding has improved its performance and advanced its acceptance by Delaware builders and homeowners. In fact, vinyl has grown to 32 percent of the U.S. siding market for new homes, with no end in sight to its growing popularity. The reason, in part, is because it’s often (but not always) cheaper than red cedar or redwood and takes less time to install. The popularity of vinyl siding is growing here in Delaware. Some vinyl siding costs about the same as the best grade of cedar, but the installed cost is still lower because it goes up faster and doesn’t need painting. A mid-class vinyl costs 2.5 times lower per square foot to install than installed price of mid-grade cedar clapboard, exclusive of trim and paint. Many of the homes in Wilmington, Dover, Newark, Middletown, Bear, Brookside, Hockessin, Milford, Harrington, Seaford, and Smyrna are using siding on their homes. The real attraction of vinyl siding for most people is its reduced maintenance.